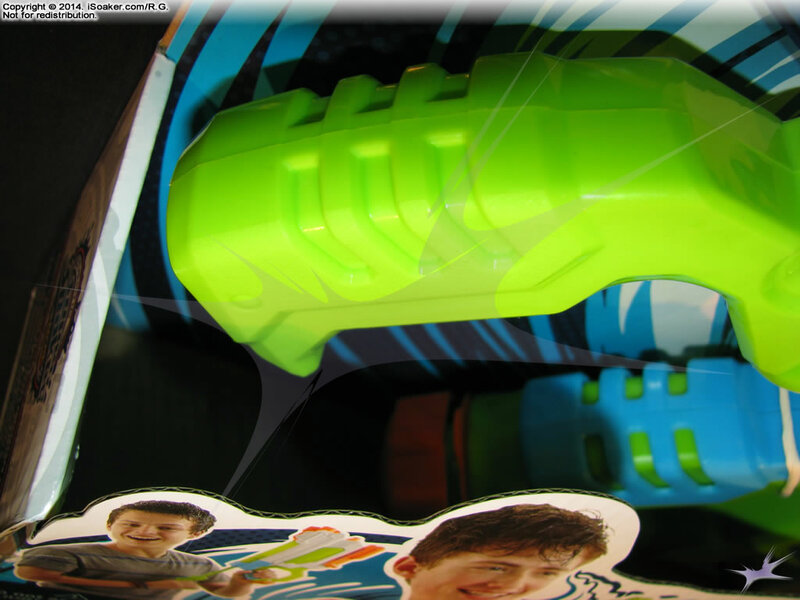 The Nerf Super Soaker Flash Flood is a new model by Hasbro Inc. for the 2015 Nerf Super Soaker line. 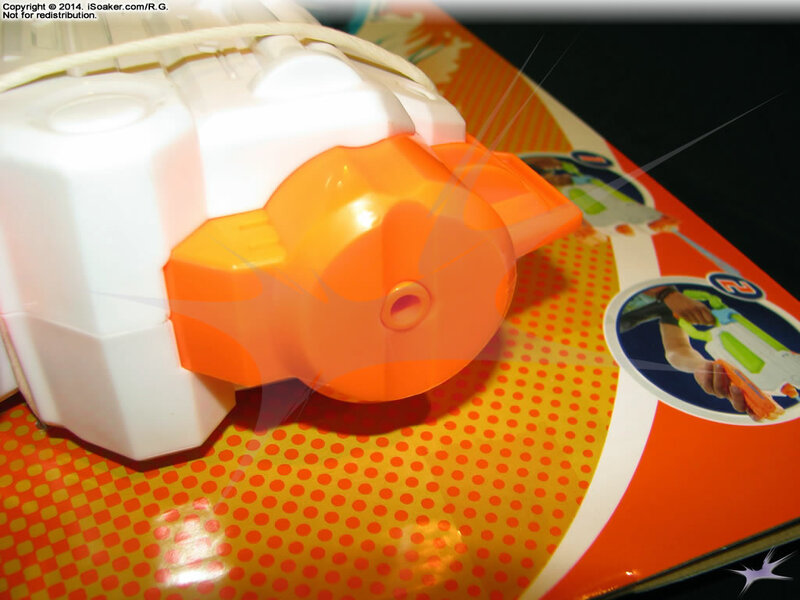 Unlike the older Super Soaker Flash Flood, the Nerf Super Soaker Flash Flood neither uses any form of stored pressure nor has much of a truly "Flood"-type nozzle. 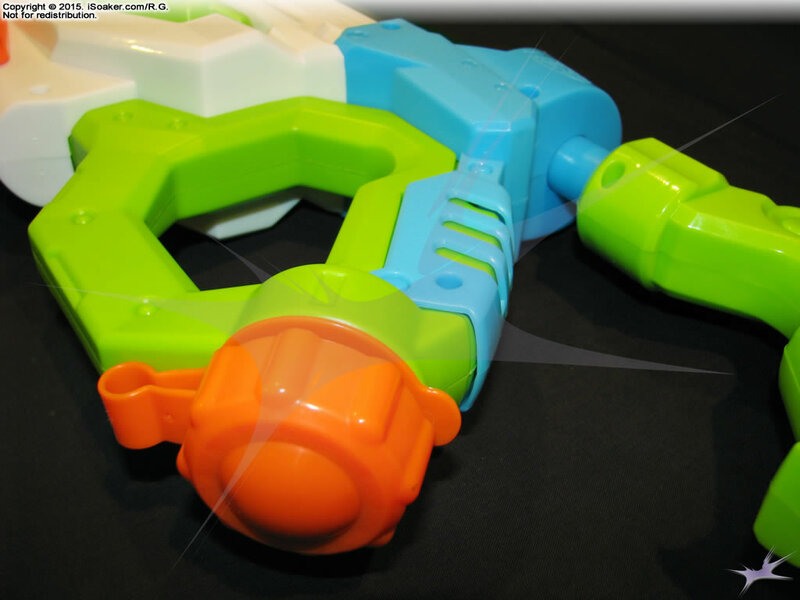 Instead, this water blaster is looks like an odd combination of a pump-action water blaster with a syringe-based water blaster attached to its top. While it looks somewhat intimidating, its actual performance and ease-of-use is far from the earlier Super Soaker Flash Flood version. 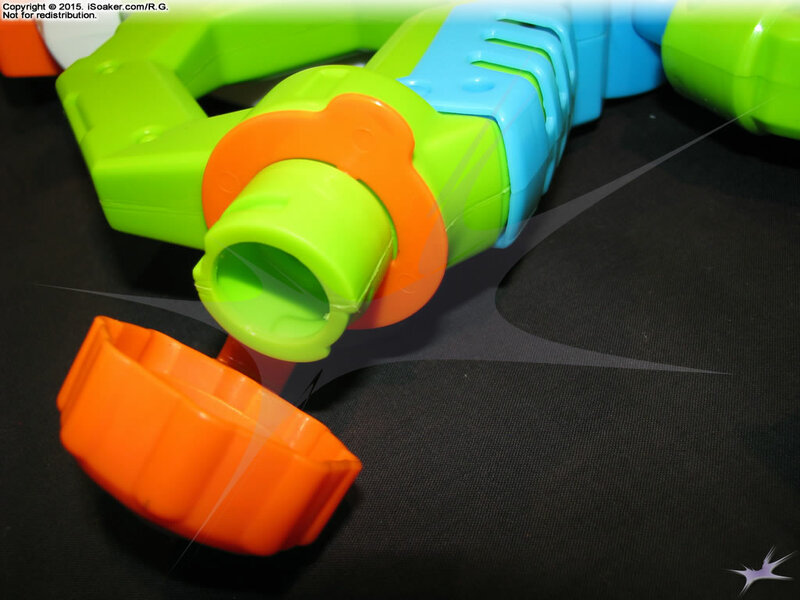 The Nerf Super Soaker Flash Flood features two nozzles. The lower, smaller nozzle is powered by the lower pump on this blaster. 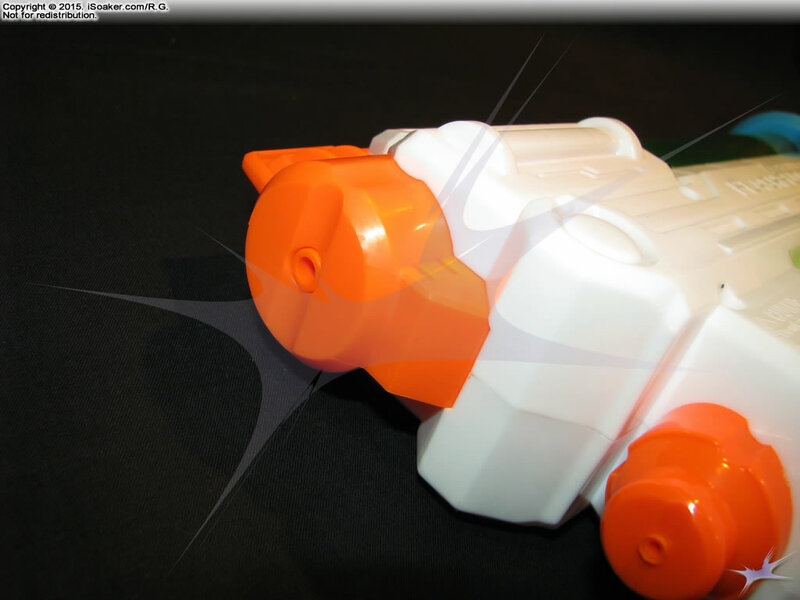 Based on nozzle size and pump configuration, performance is estimated at being similar to the Nerf Super Soaker Freezefire (2014). The upper "Flood" nozzle is powered by the upper syringe-piston that draws water from its reservoir. Unforunately, the tubing and valve leading from the reservoir to the upper-pump chamber restricts flow, making it difficult to charge the upper chamber quickly. If one tries to force the upper pump to move faster, its single O-ring seal begins to fail and allows air to sneak around the seal and enter the pump-shaft, reducing the amount of water available for a shot. Interestingly enough, the Flash Flood's transparent upper pump shaft makes it easy to tell when one is pulling too quickly since one can watch the bubbles make their way around the seal and into the pump. 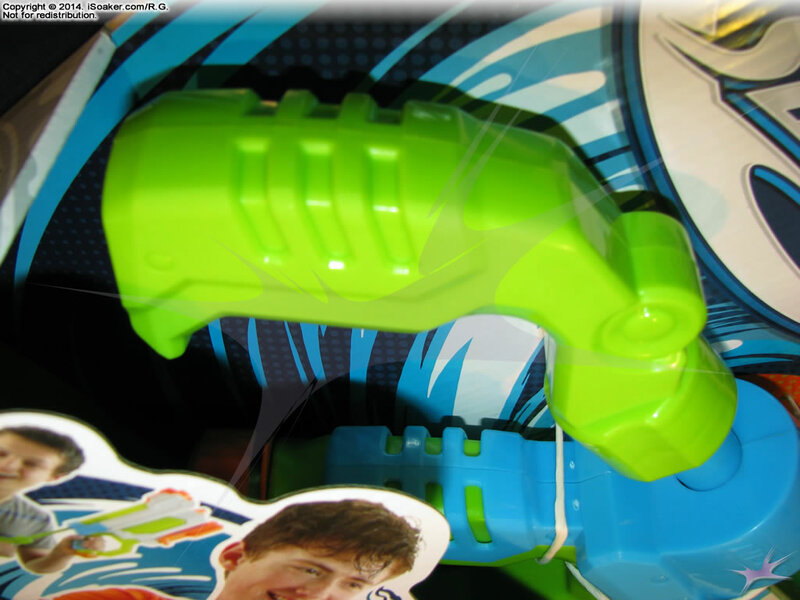 As noted above, there are two pumps on the Nerf Super Soaker Flash Flood. The upper syringe-type pump powers the upper "Flood" nozzle while the bottom, forward-facing pump feeds the smaller lower nozzle. While both pumps should function satisfactorily, the bigger problem stems from the fact that a user's preferred hand positions when using a pump-action versus a syringe-type water blaster are actually opposite. For a typical right-handed users, a pump-action water blaster is held with the trigger/grip in one's right hand while the pump grip is held by one's left hand. However, to get the most from a syringe-type blaster, a typical right-handed user often prefers to hold/aim the barrel of the syringe with one's left hand while one's right hand is on the rear-positioned pump grip. As such, for this odd combo water blaster, switching between shooting with the pump-action nozzle to the "Flood" nozzle may require swapping hand positions. Interestingly, since this water blaster is not too large, one can use both pumps while holding the rear grip area with one's dominant hand, but then aiming with the syringe-type pump becomes less forceful and less accurate. 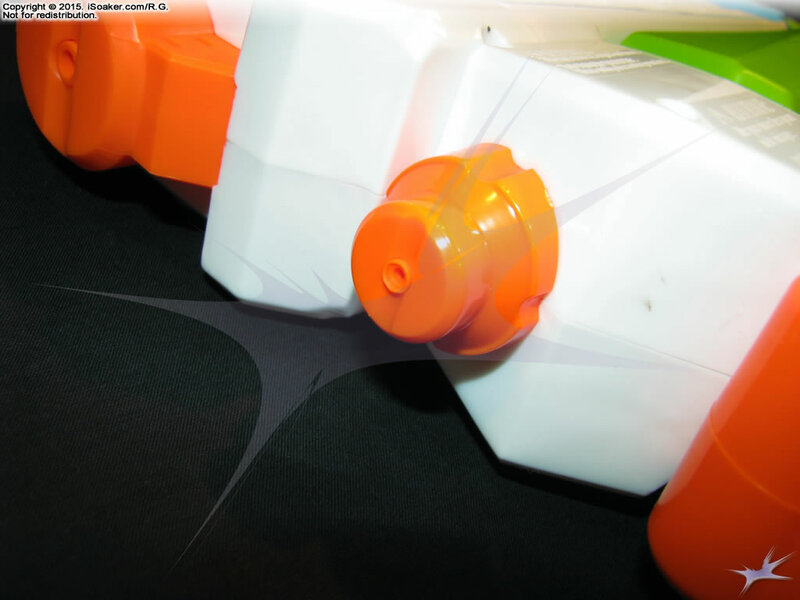 The grip area on the Nerf Super Soaker Flash Flood, akin to the current other Nerf Super Soaker models, appears to be well moulded and quite comfortable to hold. In this case, however, since this product is being kept in its original packaging, the actual feel of this particular grip was not fully tested. The reservoir on the Nerf Super Soaker Flash Flood apparently holds a little more than the Nerf Super Soaker Freezefire (2014). The reservoir cap was likely placed here due to the fact the syringe-piston part was mounted on the top. While leading to some bubbling sound during use, the noise is not too noticable. 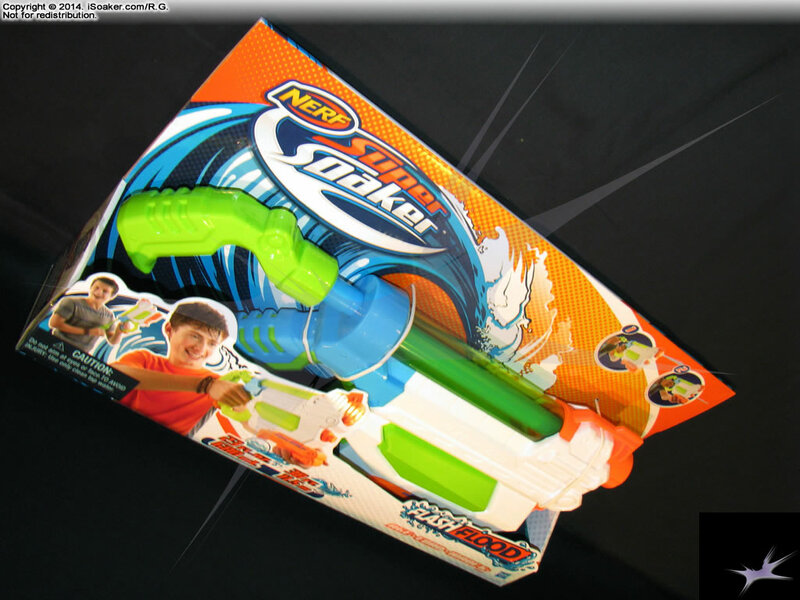 As a whole, the Nerf Super Soaker Flash Flood is a far cry from the earlier Super Soaker Flash Flood. Its awkward pump-action plus syringe-type water blasting action may look intriguing from its design, but is less-than-ideal when using. 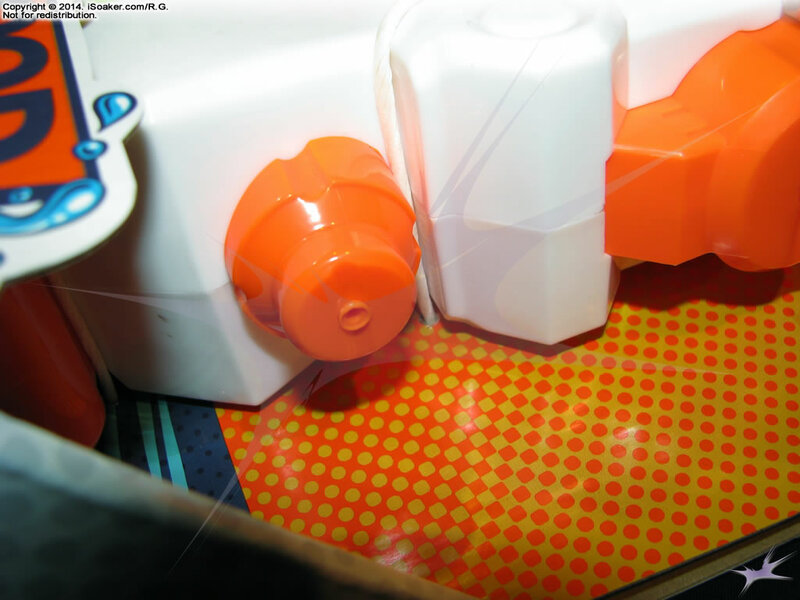 As neither function of this particular water blaster model looks interesting enough to test further, this item is being left in its original packaging and no further testing is planned on it at this time.